Tannery Bend appears out of a sleepy south Napa neighborhood like a vision from a dream. I'm not talking about the kind of dream with fairy-tale castles and sugar-plum Cabernets—you can find that upvalley. This is the kind of dream where a room filled with interesting things suddenly appears in an unlikely place—and those interesting things are beers! Or like the wistful dream I once had in which I found a secret doorway in Sonoma County that led directly to Portland, Ore. If there's nothing outlandishly dreamlike about this little suds shop in the repurposed Sawyer tannery by the Napa River, there is something of "Portlandia" about it, if only because it does not scream "Napalandia." Inside, the space is light and bright, but not antiseptically so, and dominated by a concrete bar, a big chalkboard announcing current brews and board games available, and . . . big game. Vintage taxidermy animal heads collected by co-owner Tyler Rodde's grandfather stare down from the rafters. Rodde and his wife, Lauren, also run Oenotri restaurant up the street, giving Tannery Bend an edge on the usual pretzels and popcorn tap room fare—their "bottomless popcorn" ($4) comes with a choice of bacon salt, house-made when the restaurant roasts a pig. Also on the menu: Italian pork sausage ($10), grilled cheese ($9) and Reuben ($12) sandwiches, green salad ($6), kimchi jerky ($6) and curry spiced nuts ($5). It took a three-year odyssey just to open a small brewhouse on a quiet street in Napa, says brewer and co-owner Matt Cromwell. "If you see any gray here," he says, rubbing his beard, "it wasn't here in March." Cromwell formerly brewed at the now-defunct and repurposed-for-winetasting Silverado Brewing Company, and later at Napa Smith. Since he's only made some 30-plus batches here since opening in April, he says he's still experimenting with house favorites. I like what he's brewed up so far, all of the beers named for Napa roads and landmarks: Brewed with redwood tips, Franklin pale ale has a woodsy aroma; Imola session IPA satisfies the bitter-lover at just 4.8 percent alcohol, while Salvador saphir IPA pulls fresh-peeled Valencia orange aromas out of an esoteric German hop; made with local cherries, Jack's Bend Belgian dubbel is a cola-colored, leathery, tangy experiment gone right. But as low-key and unaffected as this friendly brewhouse is, if the wine-industry talk overheard around the bar is any indication, alas, there can be no escape from wine-sodden Napa. Dream on! 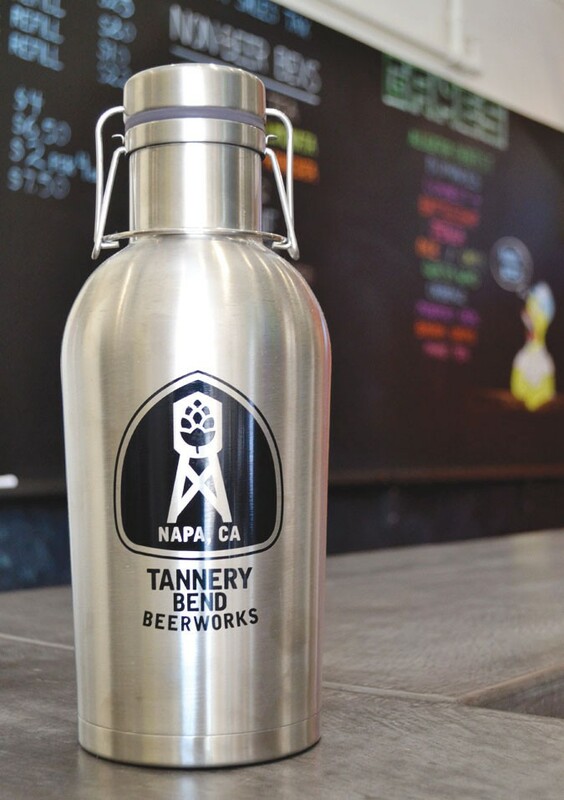 Tannery Bend Beerworks, 101 S. Coombs St., Ste. X, Napa. Open Wednesday–Sunday, noon–8pm. Growlers available. 707.681.5774.